COMET & CHARGE! March Giveaway! 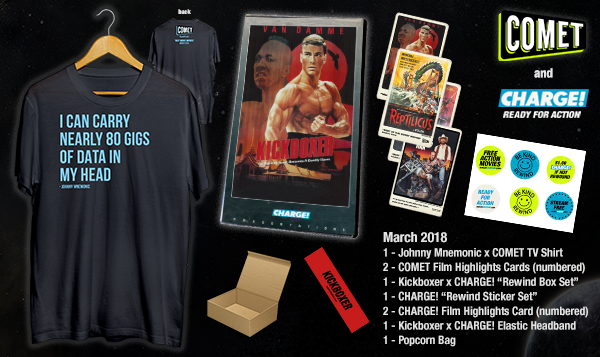 March is here and like you might have read in our earlier email, we’re super excited to share with you the newest COMET TV schedule and Giveaway as well as a new network, CHARGE!, an action network showing the most “kickin’” and “punchin’” films ever created. This month COMET TV has the best of the worst marathon, with the best of the worst movies ever created. Over on CHARGE!, there’s the Kickboxer marathon with all five Kickboxer films. And TRR want to give you the opportunity LUCKY WINNER to have an awesome March of your own! The COMET TV and CHARGE! March Prize Pack is perfect for binging some classic films and TV Shows! You have to tell us your favorite Keanu Reeves movie or an action film that involves kicking! You have to SUBSCRIBE to our website – therogersrevue.com & LIKE our Facebook, Instagram or Twitter – In addition, you have to provide a snapshot of subscribing the site and Liking our social media proof. Do that, you will earn an EXTRA entry! NOTE: If you don’t complete both tasks, your entry WILL NOT COUNT! One randomly selected person will WIN this prize pack, GOOD LUCK! 1 – Limited Edition Johnny Mnemonic COMET TV T-shirt: One of the best of the worst films ever. Can you carry Nearly 80 Gigs Of Data In Your Head… It depends on if I have my morning coffee! This shirt is exclusive and only 130 are in existence. 1 – Kickboxer Exclusive Charge! Clamshell Box: Talk about retro goodness! This Bloodsport exclusive clamshell box features exclusive throwback artwork and will immediately take you back to the days of waiting in line for new release movies at the video store! 1- Kickboxer “Kickin’ It” Viewing Kit: When you’re working up a sweat either by saving the world or sitting on the couch, this viewing kit will aid you, in your quest. It has an official Kickboxer elastic headband as well as some popcorn and stickers. 2 – Exclusive COMET TV Film Cards: The best thing to celebrate the cult classic films arriving on COMET TV this month! A limited edition set only available here! 2 – Exclusive CHARGE! Film Cards: Get in the mood to check out CHARGE! with this card set showcasing some of the awesome movies showing on CHARGE! this month! Each household in the US is only eligible to win the Comet TV and CHARGE’s March Pack. Only one entrant per email address per giveaway. If you have won the same prize on another blog, you are not be eligible to participate in the giveaway. Entries must be received by MARCH 31, 2018 @ 11:59pm EST. Any entry after the time stated, will not be qualified. Winner is subject to eligibility verification. The prize will be sent via FedEx or USPS. No P.O. Boxes please.